Places in the quarter-final stage of the Women’s Singles event at the Seamaster 2018 ITTF World Tour Lion Japan Open in Kitakyushu at stake on the evening of Friday 8th June; of the four second round Women’s Singles matches completed it was success for the favourites. The host nation’s Miu Hirano and Chinese Taipei’s Cheng I-Ching emerged successful, as did the Chinese duo of Chen Xingtong and Liu Shiwen. Japanese players very much in evidence, Miu Hirano, the no.4 seed, ended the progress of colleague Minami Ando, a player who had been required to compete in the two day qualification tournament. She emerged successful in five games (11-9, 9-11, 11-8, 11-8, 11-7). One Japanese player through to the round of the last eight, for two more it was the end of the road. Hitomi Satoi, the no.10 seed, the backspin artistry as elegant as ever, was beaten by Chinese Taipei’s Cheng I-Ching, the no.5 seed (11-7, 6-11, 12-10, 11-5, 11-8); Miyu Kato, the no.15 seed suffered at the hands of Chen Xingtong, the no.6 seed (11-2, 11-7, 6-11, 11-6, 11-6). Notably it was the third time that Chen Xingtong and Miyu Kato had met but the previous confrontations were in junior days and had little bearing on today’s encounter. At the Asian Junior Championships, Chen Xingtong had won in 2013, two years later Miyu Kato had prevailed. 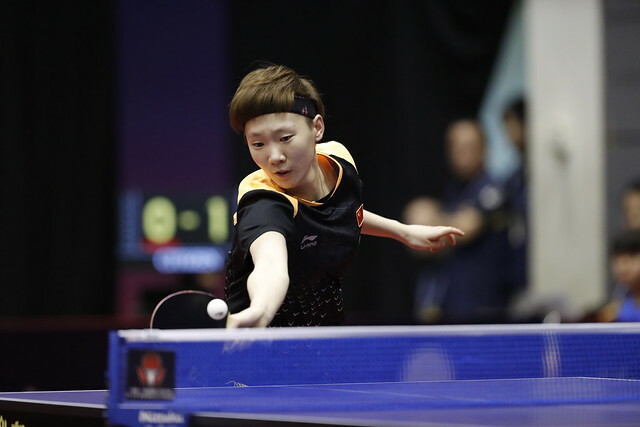 Five games wins for Miu Hirano, Cheng I-Ching and Chen Xingtong; it was exactly the same for Liu Shiwen. The no.8 seed, she ended the aspirations of Chinese Taipei’s Chen Szu-Yu, the no.16 seed (11-4, 7-11, 11-7, 11-3, 11-7) and thus maintained her perfect record. In 2011, Liu Shiwen had prevailed on the ITTF World Tour in China and the following year at the Asian Cup. The remaining second round matches plus the quarter-finals will be played on Saturday 9th June.